Tracy Marrow is better known by his stage name, Ice-T. Ice-T initially secured fame by being one of the early practitioners of a form of rap music known as gangsta rap. After co-founding the band Body Count, the urban music artist became even more famous for a public controversy that eventually ensued over his “Cop Killer” track, which glamorized the murder of police officers. The storm surrounding “Cop Killer” reached its zenith in July of 1992, at an annual shareholders’ meeting for Time-Warner, the parent company of Ice-T’s record label. It would be here that Hollywood giant Charlton Heston would take to a stage of a different sort. Heston had been given the opportunity to address the Time-Warner group because he himself owned shares in the media company. During his presentation, the legendary actor recited in dramatic fashion the lyrics from the “Cop Killer” tune, leaving the owners of the company in a stupefied state. The publicity that would follow would ultimately cause Time Warner Music to cancel the release of Ice-Ts then-upcoming album. Heston would go on to take a starring role in the Second Amendment drama that was taking place in our society. He became a stalwart defender of the right to bear arms and eventually became the leader and spokesperson for the National Rifle Association. Fate has a way of writing tales that rival the best of human authors. Ice-T, the very same rap artist that Heston had so vociferously opposed, would undergo a professional conversion of his own that would transform him into the current TV and film A-list star that he is today. He, like his former adversary, has become a persuasive voice for the Second Amendment in helping to move forward Heston’s legacy issue. Last year the rapper was being interviewed by Krishnan Guru-Murthy, an anchor for the British television station Channel 4, about a documentary dealing with the art of rapping. 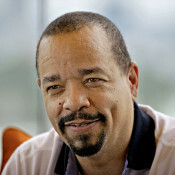 “Yeah, its legal in the United States,” Ice-T said in reply. “Its part of our Constitution. You know, the right to bear arms, its because that’s the last form of defense against tyranny. Not to hunt. It’s to protect yourself from the police.” The rapper-actor is now the narrator of a limited release documentary titled “Assaulted: Civil Rights Under Fire.” The particular civil right highlighted in this film focuses on the right to keep and bear arms. Ice-T is placing his name on the documentary adjacent to another participant in the film, heavy metal guitar virtuoso Ted Nugent. Post Continues: Hestons Tradition continued by Ice-T.